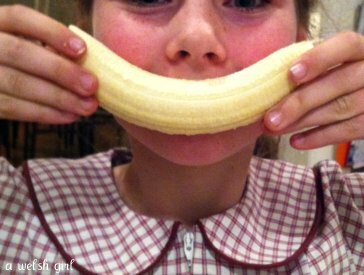 A Welsh girl in Australia: Banana smiles! Have you got any idea how much bananas cost in Brisbane?? They are hovering around the $13 per kilo! A banana is treat time - big style! Bananas have not graced my grocery list for a little while. Sibs was complaining to a work colleague visitor from the UK that came for dinner last week how it was "months and months" since she had a banana (poor deprived child..!). and arrived with a bunch of bananas - how kind. Ps the one in the pic looks yummy! That's expensive, they must taste good! I stumbled upon your blog while 'blog-hopping' and I'm always interested to read of people who have moved and live abroad. I too left Britain and now live happily in Malaysia. Ha! Don't get me started on blueberries. Our local fruit store has a sign saying "No cash or bananas kept on the premises overnight". Hee hee, every time a cyclone hits you find yourself sharing out a banana, banana bread disappears off the menu. Never mind think of how wonderful it will be when they return to their normal price range and we can remember that this is a sign of QLD returning to normal. I cannot remember the last time we bought bananas! Normally we bake banana bread every couple of weeks but not for ages. Now it is carrot cakes for lunch boxes! Fruit has become so expensive which is why we have really learnt to appreciate just how lucky we are to be living in such a productive garden, both fruit and veg. Sadly though no bananas here either!